With my last Born Pretty Store order back in August, I purchased a couple of their stamping plates to give them a try. 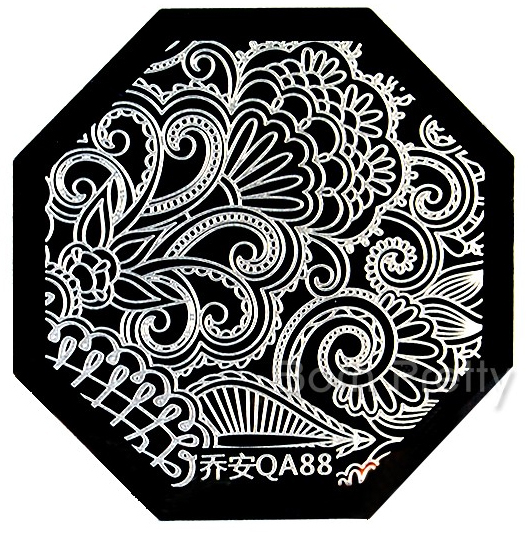 One of the first designs that grabbed my attention was this full image plate called QA88. 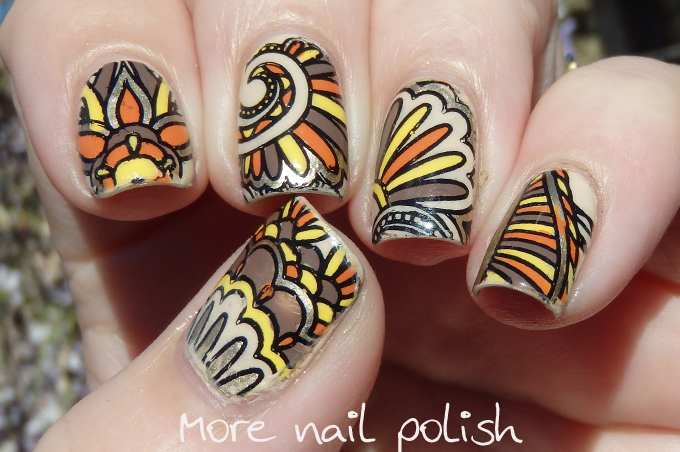 I loved that there were so many different designs on the plate, and that you could either use a single pattern on all nails, or do a different pattern on every nail, and it still pulled together into a cohesive looking design. I received my package in early September, but with the 31 Day Challenge, I didn't get a chance to try it out until now. I decided to create some stamping decals using some new OPI shades that had just arrived at my door stop. I got a few of the OPI Coca Cola polishes from the Australian release, including this awesome orange creme. Instead of having the orange glitter called Orange you Fantastic, we have this orange creme, labelled Orange you Stylish. I'll give you more details on that when I finish my swatches. I matched up Orange you Stylish with Your so Vain-illa and I Can't Copa-a-cabana, as well as with Ulta3 Cocoa bean and Essie Good as Gold. The look ended up being very Autumn feeling - which is perfect for all my Northern Hemisphere readers! I was really pleased with the quality of the QA88 stamping plate. It's nicely etched with no flat spots. This means it has smooth stamping edges and picks up easily. The plate comes with a protective blue plastic on the front and back. Obviously you have to remove the plastic from the front to be able to stamp with it, but you can leave the plastic on the back to reduce any sharp plate edges. Here is a shortish video that I recorded as I created this mani. Now here is the best part. The lovely ladies from the Born Pretty Store have provided me with 10 QA88 stamping plates for my readers. They will send the plate directly to the winners, so entry is open world wide. The Born Pretty Store doesn't have any requirements about you guys needing to follow their facebook page or other social media accounts (although of course you can if you want to), so to get an entry I'm just going to get you answer a question below in the comments. I love the Born Pretty Store nail products and I'm always looking for something new from their site to try. I want to know what you want to try, or what your favourite nail products from the BPS are. Which Born Pretty Store nail product do you most want to try? or What is your favourite Born Pretty Store nail product? Entry's close this Sunday 12 October at 11.59pm. Ten winners will be chosen at random from all valid entries. Winners names will be displayed on the widget and I will also email each winner. Winners will need to respond to my email within 2 days with their postal address otherwise another winner will be selected. Open World Wide. My fave BPS product is their Neon stud rhinestones. My (latest) fave is their rectangular stamper! What I most want to try is their square stamper (on its way to me as I type this). The item that I like best from their offer is a bit silly - wax pencil for picking up rhinestones, beads and studs. I'm quite clumsy and this helps a lot when I want to use such decorations on my nails. There are so many things in that store that I want to try, but I think the one I keep thinking back to is the wax pencil used to pick up studs. Every time I pull out my own studs or stones, I always think about how much easier it would be with that wax pencil. The glow in the dark nail polish is what I'd like to try most, and since I haven't actually tried anything from BP, we can also call it my placeholder fave, haha. I'm interested in trying their holos. Thanks for swatching them! Can't decide whether my favourite Born Pretty product should be their striping tape (so many shiny rolls at such great prices, that give those fab stripy manis), or their stamping plates (interesting images for great value). But I'm sure the product I'd most like to try is their range of glitter so I can experiment with some glitter manis. What I most want to try is their square stamper. I really want to try their stamping plates, I just love stamping and have yet to try their products yet! Love this manicure! So beautiful with all the fall colors! I really like their mail foils. So many colours and effects! 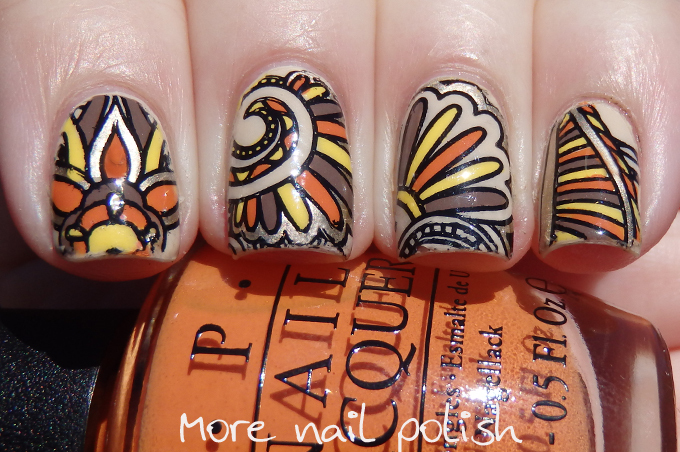 I LOVE the Dancing Peacock Stamping plate (# 16851)! And the price is amazing, Definitely going to have to grab it! And I love the all-over plate they are giving away as well. I can see SO many options and ways to wear it! Great design! I love it. The QA96 plaid stamp template! Also, this post might be the best thing I've seen on the internet all WEEK. I've been looking for a good tut on how to make my own nail decals. The tartan stamping plate! My family is scottish so I'd totally love that one! I most want to try some of their new stamping plates. My favorite item is a black bow ring I added for fun one of of my orders and I ended up loving it. 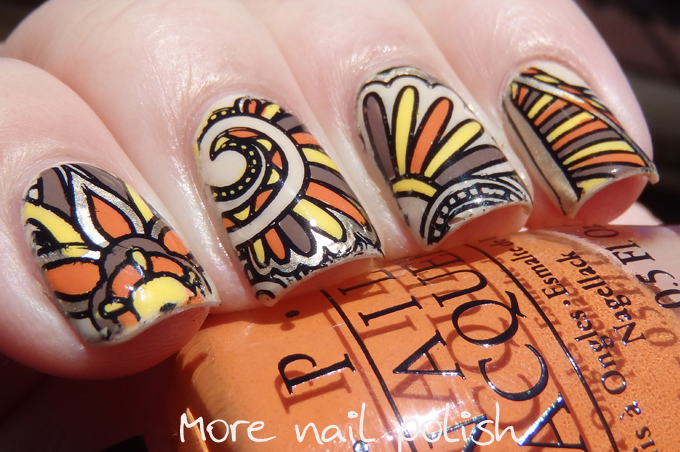 I would love a big squishy stamper but that plate is gorgeous too! Some of their stamping plates, I've never stamped but wanna start to give it a try! Crossin' my painted fingers!! So many things I want to try out, but I've been longing to try their decals (specifically, mustache decals) for quite some time. I have never tried stamping but I am so intrigued by it! I am not very artistic sadly. 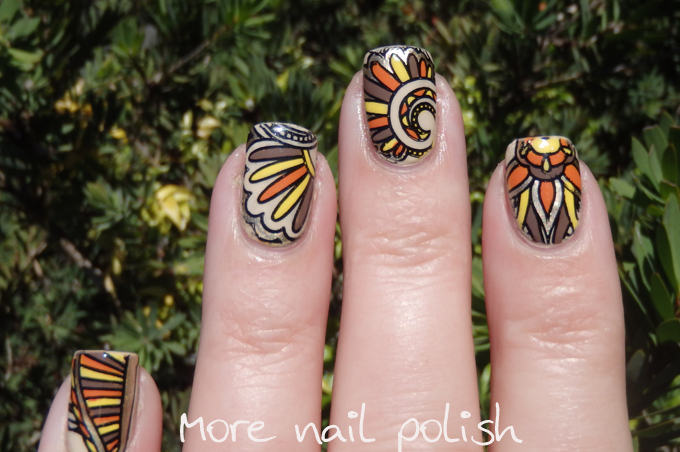 You can get great results stamping without having to be very artistic. Give it a go! I'd love to try their Christmas stamping plate, as Christmas is coming up and I want to try some new designs this year. Any of the newest stamping plates thye've released! I'd love to try the Black Cat & Rose Theme Nail Art Stamp. 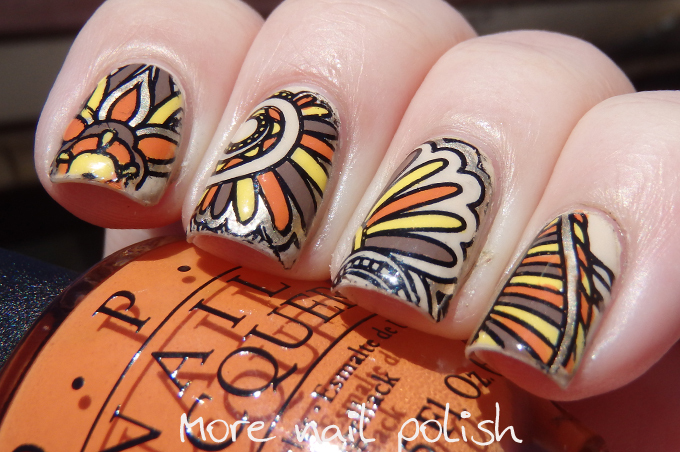 I've never tried to do stamping before, so I'd probably most like to get some stamping plates to try. I'd want to try their matte topcoat - am currently on a quest to find a new one to replace my beloved essie Matte about you. I'd love to try stamping over some of that green holographic polish of theirs! Just love all the stamping plates! Any of their stamping plates (but preferably the mix patterns plate) because I've not tried stamping before but would love to. I'd really like to try the #12 green holo - it's been on my wishlist for a while now, but I held off because it was winter and not that sunny. But now we're into the sunnier months it's definitely holo time! I'd like to try the #12 green holo - it's been on my wishlist for some time now but I haven't been wearing holos because it's been winter and not all that bright But now we're heading into the sunnier months it's definitely time to bring on the holos! Also, a while back (like a year or two) I ordered a plate from Born Pretty and it was terrible, and I have been dubious since, but last time I ordered I grabbed QA86, which is hearts and also some snowflakes, and I've really been impressed - easy to use and the images came out well. So if you are like me and had a bad experience in the past, it's worth trying again.